I began serious studies on the clarinet with Walter Lear, clarinettist with the Royal Philharmonic Orchestra. From him I learned the rich tradition of English woodwind playing. I then won a place at the Guildhall School of Music, gaining my Performer's diploma and the School's Chamber Music prize. I also won a place on the post-graduate orchestral course, allowing me to augment my studies with a wealth of playing experience. 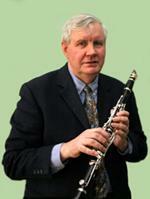 At the Guildhall my professor was Wilfred Kealey, himself a student of the renowned British clarinettist Charles Draper. During my time at the Guildhall, I received an invitation to join the staff of the Junior Exhibitioner Scheme, a post that I held for seven years. Once I had left the Guildhall the Kent Music School invited me to work as a clarinet specialist and I continued studies privately with Yona Ettlinger, and through him I discovered the French tradition of clarinet playing. After a short period of freelance playing, together with colleagues I formed a chamber music group, based in London, which included members of the major London orchestras and founder members of the Fitzwilliam String Quartet. In later life, wishing to deepen my knowledge of music, I enrolled with London University on the BMus course. The course gave me a profound understanding of music, and has since proved invaluable both as a performer and as a teacher. I then continued with informal post-graduate studies with Dr Michael Allis at the Royal Academy of Music in which I focused on composition and allied subjects. I now continue my researches into clarinet literature and the music of the Baroque period.